Related to daisies and sunflowers, lettuce (Lactuca sativa) is the ultimate salad green and a nutritious, yet tasty leafy vegetable. Lettuce leaves boast a generous content of essential nutrients, notably vitamins K and A, folate, iron and manganese, not to mention trace amounts of other essential nutrients. While the leaves, stems and seeds of the vegetable are all edible, not to mention palatable, lettuce is grown mostly for its large, crisp, somewhat bitter leaves. What does lettuce look like? Lettuce looks a lot like a loose green cabbage, but with larger, softer, more flexible leaves. The leaves are deeply veined and may turn a deeper color as they mature. The more mature the vegetable, the larger the leaves. Differences in appearance occur depending on the variety. Popular varieties include looseleaf lettuce, Romaine, iceberg, butterhead or cabbage lettuce and so on. Romaine lettuce, for example, is shaped more like an upright endive, while iceberg lettuce looks a lot like an ordinary cabbage, but with less rigid leaves. Some lettuce varieties are grown for their stems, while others for their seeds. For instance, lettuce grown for its stems has a long, light green stalks the size of leeks, with a smaller, dark green leaf head. Asian cuisines make use mostly of lettuce varieties grown for their stalks or oil seeds. What does lettuce taste like? Taste differs a lot depending on the variety. I also grow my own lettuce and I find that younger, more tender lettuces are crisper and sweeter, while more mature ones tend to get bitter, chewier. However, some types of lettuce are grown especially for their crisp texture, other for their sweeter taste and so on. It really depends on the variety. 1) Great source of vitamin K. Like most leafy green vegetables, lettuce is a great source of vitamin K (126.3 μg). In addition to supporting bone health and blood coagulation. Vitamin K helps prevent calcium deposits on the inside of our artery walls, contributing to maintaining cardiovascular health. However, you need to monitor you vitamin K intake very carefully if you are on anticoagulant medication. This is because vitamin K encourages blood to clot in order to prevent hemorrhaging, working against anticoagulant medication. Because it may result in higher risks of developing blood clots, it is recommended to keep a low leafy green vegetables intake while on anticoagulants. 2) Good for eyesight and immunity. Like most leafy greens, lettuce is a good source of vitamin A, a nutrient essential for good vision. The vitamin A and provitamin A antioxidants in lettuce (beta-carotene, lutein, zeaxanthin) not only maintain eye health and improve nigh vision, but also directly protect the retina from damaging free radical molecules from light. This is believed to help lower the risk for degenerative eye conditions such as loss of central vision. Moreover, vitamin A (370 μg) contributes to a strong immune system by ensuring healthy mucous membranes at the levels of the eyes, nose, mouth, throat, stomach and lungs (see articles on essential vitamins and minerals for a strong immune system). 3) Overall good source of essential nutrients. Aside from vitamins A and K, lettuce provides moderate to small amounts of almost all essential nutrients, notably vitamins B1, B2, B5, B6 and B9 (folate), iron, manganese, potassium, phosphorus, magnesium and calcium. Regular consumption not only helps prevent vitamin and mineral deficiencies and their negative effects on our health, but also exerts restorative properties and contributes to a feeling of well being. 4) Encourages weight loss. Lettuce is almost 95% water and has only 15 kcal/100 g of leaves, not to mention less than 1% sugars and less than 3% carbohyrated. If you are looking to maintain a steady weight or even begin a healthy weight loss program, then lettuce is a good option. 5) Can protect against degenerative diseases of the nervous system. Research suggests that romaine lettuce contains gallic acid (22.7 mg/100 g), vitamin C (31 mg) and several polyphenols, notably isochlorogenic acid. While its antioxidant content is inferior to that of other vegetables, Romaine lettuce may offer efficient protection against nervous system degeneration due to the fact that it is consumed more often and in larger amounts than other greens. 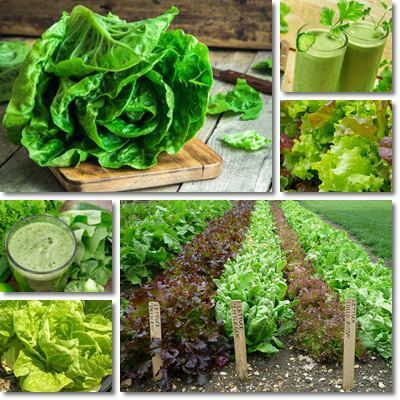 This basically means that the intake of healthy protective compounds from lettuce is high enough to offer protection to the nervous system (Antineurodegenerative effect of phenolic extracts and caffeic acid derivatives in romaine lettuce on neuron-like PC-12 cells). 6) Minor analgesic effects. Certain studies suggest that the common lettuce may hold minor analgesic properties, while lacking the common side effects of regular analgesics. However, research on the subject is incomplete. Overall, lettuce is a healthy addition to any diet, provided it is consumed fresh. According to a study entitled Effect of acute ingestion of fresh and stored lettuce on plasma total antioxidant capacity and antioxidant levels in human subject, the main constituents in the vegetable have a higher bioavailability following ingestion on the condition the vegetable is consumed fresh. Nevertheless, know that eating lettuce can cause allergic reactions in predisposed individuals which react to a certain protein in the vegetable. Moreover, the leafy green can be a source of pathogenic bacteria like including Escherichia coli. It is recommended to check the origin of your lettuce and wash it well before eating. People with immune system deficiencies, children and the elderly are advised to avoid all foods and food preparations that could result in foodborne illness.